Comfortable, well appointed with an open-plan living/dining area and three separate bedrooms and bathroom with shower and toilet. Full cooking and fridge/freezer. All beds are made up with full linen and towels supplied. Bedding configuration is 2 rooms with a queen bed and the 3rd with 3 single beds. Has TV, Heating, laundry, and full kitchen facilities. Tariff: $150.00 (3 persons), extra person $20.00 children 2 years and under no charge unless extra bed requested. Very Comfortable unit, kitchen with hotplates, microwave,fridge/freezer etc. Ensuite with shower and toilet . Guests free laundry, and BBQ's available on the park. All motels are fully self-contained with all bedding and towels provided. 2 Bedrooms one with a Queen bed and 2nd with a tri bed. (double on bottom and single on top.) Total of 5 persons max. Parking available at unit door. Tariff: $145.00 (1-3 persons), extra person $20.00 child 2yrs and under no charge unless extra bed requested. Very comfortable unit with kitchen hotplates and microwave,fridge etc. Free guest laundry and BBQ's available on the park. Has 2 sets of good single bunks = 4 beds. All fully self-contained. With all bedding provided. Parking at door of unit. Comfortable unit with King-size bed. Kitchen with hotplates and microwave,refrigerator etc. Free guest laundry and BBQ's available on park. Tariff: $120 single, $130 2 persons. Standard cabins are all carpeted and heated, and include electric jug, table and chairs. Use shared facilities in our modern amenities block (crockery and cutlery supplied). Each unit has one Queen bed and two single beds. All beds have bottom sheet, pillow and pillow case supplied, bring own sleeping bag/duvet, towels, or hire is available. Free guests Laundry, showers and BBQ's. There is a good choice of power sites available at most times. 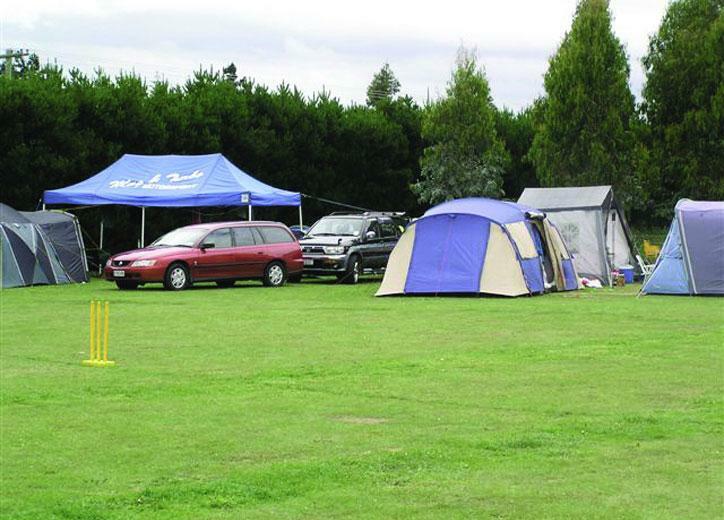 Large flat sites for camping, caravans, campervans and motorhomes. Large fully equipped guests kitchen. No coins needed for showers or the laundry. Large open flat areas for camping in tents or vans not requiring power, but do require all the other amenities that guests appreciate. No coins needed for showers or the washing machines. Large fully equipped guest kitchen.